A meeting was held in Modena to develop a strategic portfolio of, and explore linkages between, the next generation of SCAR Research Programmes (SRPs). An agenda is given in Appendix 1 and a list of attendees in Appendix 2. The meeting was held at the University of Modena and Reggio Emilia (Appendix 3). A list of acronyms is included in Appendix 4. The objective of this meeting was to plan how to present the SCAR Delegates with a coherent, linked package of new SRP programmes for approval. To do this the proposals need to be well developed, widely supported, and integrated. Will each proposal be ready for 2012, or would a particular proposal benefit from a workshop etc. before being delayed to 2014? Does the concept rise to the level of an SRP or would an Expert Group be more appropriate? 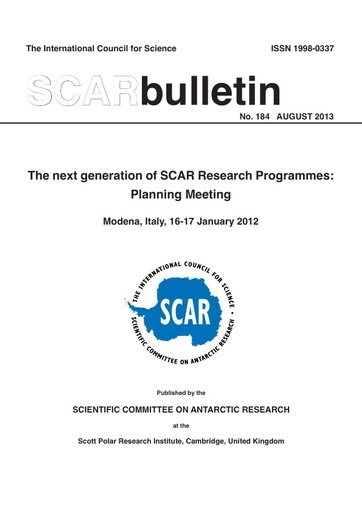 Could (or should) the programmes be merged in some way, either with each other or with other SCAR groups or programmes? An integrated, high quality, package of new SRPs should be developed so the Delegates are not put in the position of picking and choosing. Having a united, integrated plan and submitting realistic budgets can do this. Total funds available (if membership fee increases are approved) are likely to be a maximum of $120,000 including the current SRP Astronomy and Astrophysics from Antarctica (AAA). Does each proposed SRP need the full $20k for a full eight years (or $14k if the proposed fee increases are not approved)? Consideration was also given as to how, and by whom, the package should be presented to the SSG plenary and in particular to the Delegates.